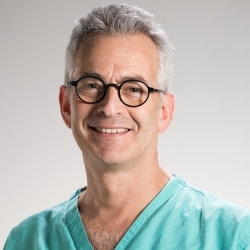 Led by top vascular consultant, Dr Jocelyn Brookes, the new Varicose Vein Removal Service at Royal Free Hadley Wood Hospital in Barnet, North London offers rapid access to specialist treatment of varicose veins in accordance with NICE guidelines. Varicose veins are commonly dismissed as a trivial or a purely vanity issue ('cosmetic') and expert treatment and care is getting harder to achieve on the NHS. Yet the NICE guidelines for varicose veins which are based on the best medical evidence available, recommend that early referral to a specialist centre, diagnosis with duplex ultrasound and treatment by Endovenous Laser ablation (EVLT, or similar thermal ablation method) is not only medically justified, but less expensive overall than leaving people to suffer untreated. 30% of adults are affected to some extent by varicose veins which cause pain, bleeding and may progress to open ulceration around the ankles. Compression stockings are expensive and ultimately ineffective as although they ease the pain of varicose veins, they do not stop it progressing. Varicose skin damage and ulceration is best treated by fixing the underlying varicose vein pathways which allows the skin to heal and the patient to return to their normal life. Early referral to a specialist vascular vein unit is recommended by NICE (IG168). The Royal Free NHS Hospital, London (Hadley Wood Clinic) has therefore established a brand new Vein Service in accordance with the UK NICE guidelines for speedy diagnosis and state-of-the-art modern Laser treatment. With top Royal Free Vascular Consultants and a dedicated team, this service offers the best clinical treatment for both NHS (e-referral) and paying patients at the best possible price. Is your job causing varicose veins?